I think skirts are a great thing to sew for a newbie like me! I really hope to get brave enough to start on exciting things like quilts or dresses soon, but I'm still working on the basics for now. This skirt is made out of a piece of batik cloth that I've been using as a tablecloth for various occasions and parties at my house (I have less exciting tablecloths for everyday use). I love the brightly patterned fabric, and have planned to transform it into something wearable ever since I got my sewing machine. I just cut off a big rectangle of the fabric, used the dental floss trick to gather it, and sewed it into a waistband made of leftover fabric from another project. So this is my first 'free' sewing project or at least my first one that is made completely out of materials I already had on hand. Pretty good for a tablecloth, if I do say so myself. I wore it the same day that I made it, even though I was washing the floors that afternoon, and I felt like a 50s lady doing housework in my fancy skirt. I'm appreciating the colors even more now, because all I get to wear to cosmetology school, today and everyday, is black and white. I'll talk more about that later. So cute! I would never guess that was a tablecloth. That is the cutest skirt! I love it! nice job! Really sweet skirt! How fun! It looks really good. I got a sewing machine recently at a yard sale and after I figure out how to get it threaded and make sure it works right, I want to get started sewing. I love the colours and the beautiful flowers. I never would have thought it was a tablecloth or that you made it yourself. Flaunt it! I'd love to see what you can do a shower curtain. :) seriously though, that looks incredible!! Ok, that looks AWESOME! Great work! Love the color and the pattern! High 5- you are 4 away from 200! I love the texture of that cloth. The colors are great too, but the texture makes it look all ... rich. It wouldn't be the same if it was just a print. you turned a tablecloth into a skirt? I love this! I'm dying to know - what's the dental floss trick? I want to know what the dental floss trick is too! I'll have to google it :) LOVE the skirt and whole outfit. That skirt is so pretty! And you made it from a tablecloth?!?! WOW! I love it! Great job! No one would ever know! totally awesome! I had an Idea of getting a batik dress made for me last week, so I was like, "Déjà vu!" when I saw this! This looks great, and I love the print and colors. I wish I had some neat looking table cloths like that one, but you've inspired me to search for some while shopping to turn into a circle skirt too. 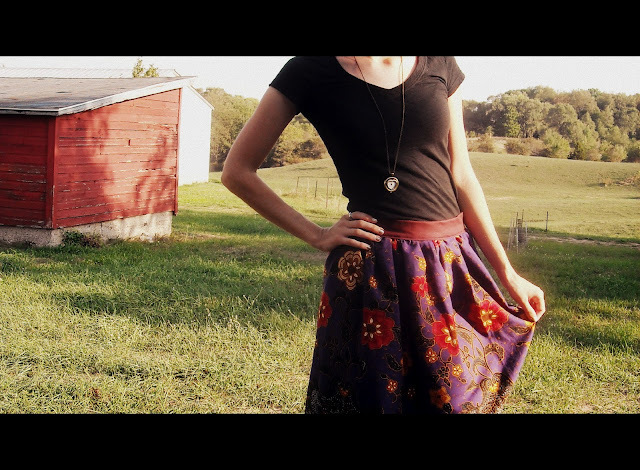 I have some super easy tutorials on skirts you might enjoy trying on my blog at http://thedomesticatedprincess.blogspot.com. I just learned to sew this year, so I also enjoy making skirts. One of these days, I'll attempt zippers and buttons. Awesome...!!! !I am a huge fan of anything that involves recycling, thanks! I love the colors in that fabric. So rich! Love this outfit! Found you on the Linky Party! Ooh! Your skirt is adorable!! This turned out adorable! Thanks for linking up! I'm featuring it on Tuesday. I love that fabric! You did a beautiful job. I would have never guessed that your skirt was formerly a table cloth. Fabulous colors! Great job, Rachel!